I n this chapter, in fact throughout this book, the primary focus is on the sporophyte generation of vascular plants. This is not by choice, but rather reflects the general paucity of information about the gametophyte phase in most fossil plants. Although there is some information about the game-tophytes in certain seed plants (Millay and Eggert, 1974; Chapter 14), information about fossil vascular plant game-tophytes is generally rare. Until recently this has been especially true in discussions of early land plants and has resulted in a variety of theories to explain both the origin of the dominant sporophyte phase and the absence of gametophytes in the fossil record (Chapter 6). Some of these ideas have influenced the interpretation of the Rhynie chert sporophytes. One of the early theories suggested that Aglaophyton major represented the sporophyte and Rhynia gwynne-vaughanii, the free-living gametophyte phase of a single plant (Pant, 1962). 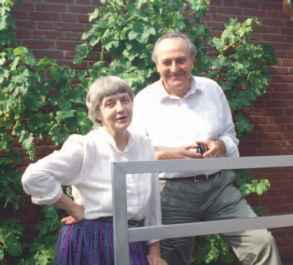 The idea gained support from the homologous theory of the alternation of generations (Chapter 6), since there were no specimens of R. gwynne-vaughanii known to possess sporangia at that time. This theory has been abandoned since R. gwynne-vaughanii was subsequently shown to possess terminal sporangia (Edwards, 1980) and A. major is now known to be structurally somewhat different from a vascular plant. 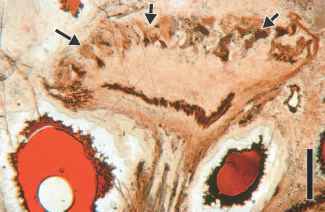 Another theory suggested that the small protrusions near the base of R. gwynne-vaughanii axes represented archegonia (Lemoigne, 1968). According to this hypothesis, the rhizoma-tous portion of the plant represented the gametophyte phase and the aerial upright axes bearing sporangia constituted the spo-rophyte. Such a situation might be viewed as evidence for the antithetic theory and parallels the life history in modern bryo-phytes, where the sporophyte phase is permanently parasitic on the gametophyte. 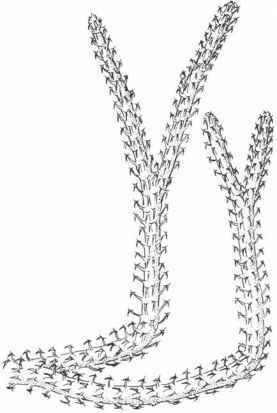 Although this hypothesis cannot be totally discounted, to date there is little structural evidence in the form of a transitional zone or foot-like structure, which should be present at the base of all R. gwynne-vaughanii plants. 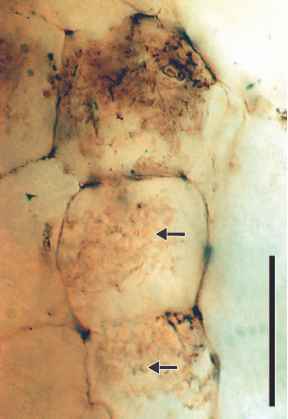 One fossil that was thought to support the hypothesis of a bryophyte-like gametophyte is Horneophyton lignieri. Several features of this genus are similar to those found in bryophytes, especially the columellate sporangia and corm-like base. Some suggested that the relatively simple modern hornwort Anthoceros could represent an early morphological type that would lead to the more complex sporophyte of H. lignieri. It is important to understand that these ideas were advanced at a time when many hypothesized that the bryophytes represented an intermediate stage in the evolution of vascular plants from the green algae. Today the hornworts and bryophytes are mostly considered to be paraphyletic (Chapter 5). There is continuing disagreement, however, as to whether the liverworts or the hornworts represent the basal group among the bryophytes (Nickrent et al., 2000; Friedman et al., 2004; Shaw and Renzaglia, 2004). 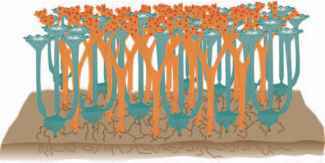 We are still a long way from understanding the evolution of the sporophyte of vascular plants, as well as the nature of the plant body in a number of fossils that exhibit a bryophytic level of organization. Some exceptionally well-preserved fossils that do contribute to a better understanding of the sporophyte-gametophyte relationship in early land plants have been described by the Remys (FIG. 8.47) from the Rhynie chert (Remy and Remy, 1980a, b; Remy et al., 1993). One of these is Lyonophyton rhyniensis (FIG. 8.48), a small axis that terminates in a shallow, bowl-shaped structure (~5.0mm in diameter), described as a gametangiophore (gametophyte) (Remy and Hass, 1991a). Antheridia are distributed over the entire upper surface. 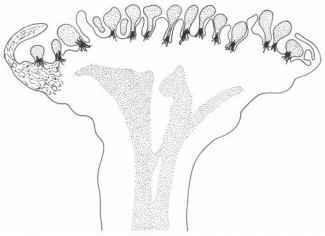 Each antheridium is characterized by a central mass of sterile tissue (columella), and many contain exceptionally well-preserved, coiled spermatozoids (FIG. 8.49). Stomata (FIG. 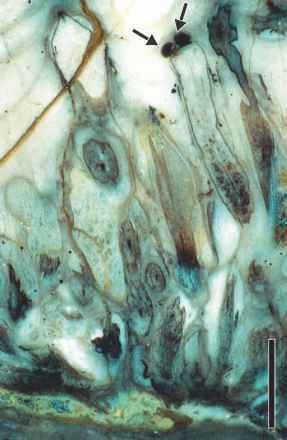 8.50 ) occur on the lower surface of the gametangi-ophore bowl. In the center of the stalk are dark, elongated conducting cells which do not extend into the bowl itself. The similarity of epidermal cells and conducting elements has been used to demonstrate that Lyonophyton rhyniensis is the gametophyte of Aglaophyton major. Kidstonophyton discoides (FIG. 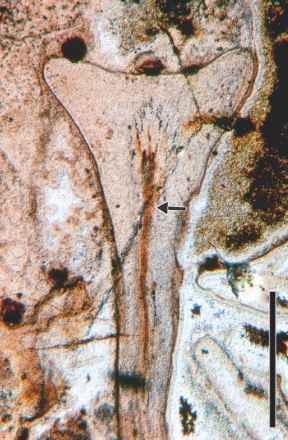 8.51) is another gametophyte discovered in the Rhynie chert that resembles Lyonophyton (Remy and Hass, 1991b). 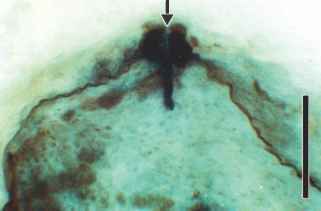 It consists of a stalk terminating in a shallow, cup-shaped structure (antheridiophore) (FIG. 8.52) that contains numerous antheridia interspersed among ridges of sterile tissue. Spermatozoids have also been described. The sporophyte in the Kidstonophyton life cycle is Nothia aphylla. and contain up to 50 antheridia. 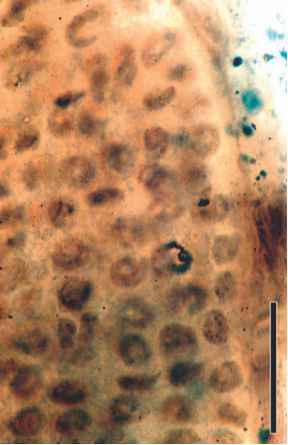 Langiophyton mackiei is the gametophyte of Horneophyton lignieri. The most recent game-tophyte described from the Rhynie chert is Remyophyton deli-catum (FIGS. 8.53, 8.54) (Kerp et al., 2004). Unlike the other Rhynie chert gametophytes, those of R. delicatum are attached to rhizoid-bearing protocorms (Fig. 8.38). The upright axes possess S-type conducting elements like those of the sporophyte R. gwynne-vaughanii. 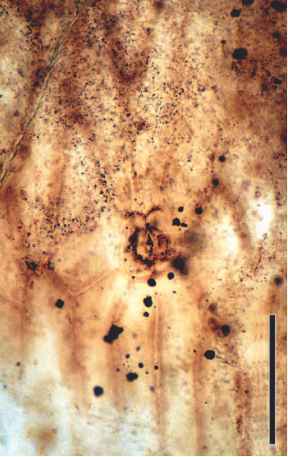 Gametangiophores are unisexual with the larger ones bearing archegonia. to be endomycorrhizal (FIG. 8.56) (Taylor et al., 2005c). As more gametophytes are discovered it will be interesting to see if any of the antheridiophores and archegoniophores are found attached to some type of thallus-like structure. figure 8.52 Longitudinal section of distal end of Kidstonophyton discoides antheridiophore showing several anth-eridia (arrows). Compare with FIG. 8.51. (Bar = 1 mm). figure 8.55 Diagrammatic representation of a population of Lyonophyton gametangiophores associated with mycorrhizae. morphotaxon Sciadophyton represents a gametophyte stage of several early land plants. The anatomical and morphological similarity of the gametophytes described from the Rhynie chert to date would appear to strengthen Remy's hypothesis. 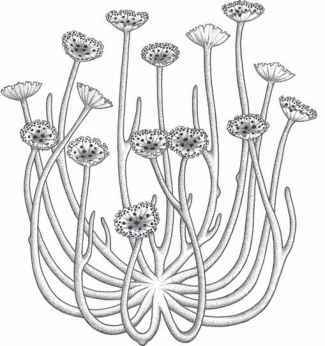 Calyculiphyton is an Emsian (Lower Devonian) compression fossil that may also represent a gametophyte (Remy et al., 1991). In this type, elongate axes terminate in cup-shaped structures that morphologically look much like those of Sciadophyton. The anatomically preserved gametophytes from the Rhynie chert provide the first real fossil evidence that pertains to the evolution of alternation of generations. The nature of the conducting strand and relationship to the sporophyte phase of Rhynie chert plants substantiate the existence of free-living, terrestrial gametophytes as early as the Early Devonian. The conducting strand of Aglaophyton major and several other early land plants provided the impetus to reevaluate the conducting elements of many early land plants and to use this feature to establish the biological affinities of the sporo-phyte and gametophyte phase. To date there is little evidence of post-fertilization stages or the new sporophyte (embryo) in any early land plants. Kerp et al. (2004) described and illustrated some tissue extending from an archegonial neck of Remyophyton delicatum that might represent the gameto-phyte-sporophyte junction and development of the new sporophyte generation of R. gwynne-vaughanii. What is the name of gametophyte stage of Rhynia gwynnevaughanii? Which is not associated with the gametophyte generation (figure 16.3)?